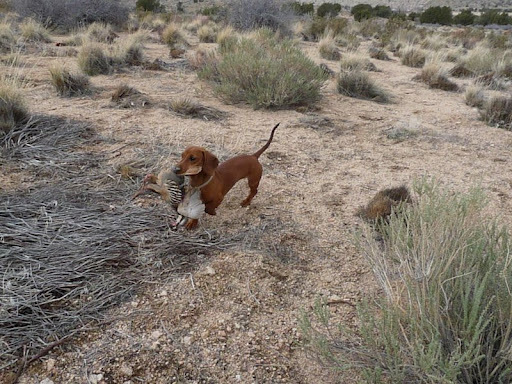 THE MAKING OF A "BIRD-DACHSHUND": DIGBY FLUSHES AND RETRIEVES A CHUKAR PARTRIDGE! THE LEGEND GROWS. When last we left Digby, the intrepid 7 month old Dachshund who thinks he is a bird dog, he was retrieving a shot bobwhite quail at the game club. ( See last photo in this blog entry: http://www.blogger.com/post-create.g?blogID=5542804987486451793 ) Hmm. Not bad. But yesterday’s performance was in the realm of surreal. At the end of my hunt with Pride the English Pointer our game club manager caught up with me in the field and said “Meet me over near the west gate. I put a chukar out for Digby.” I was to be the gun. Now, I have shot over Springers and Lab’s many times, but a flushing Dachshund?? Never. Sure enough, when I got there Andy and Digby were marching through the high desert brush. As we neared the end of the cover, as the grassy area began, I watched Digby intently. He was hunting! Suddenly the little pointed nose swung around and he dove into a bush. He had smelled that chukar. The bird beat a hasty retreat and I made certain that I hit it. Down it came and a furiously running Dachshund was right after it. The annals of gun dog-dom are being re-written and a long chapter will be added for Dachshunds. Gee, I wonder if there is such a thing as a Dachs-setter? Only selective breeding will ever let us know! Oh, Pride and I had a nice time. Great workout on a beautiful day. However, she doesn’t think much of Digby. I think she’s jealous. Digby gets to ride in Andy’s coat when he’s on the club quad 4-wheeler. She doesn’t. Tune in next week. Maybe he’ll retrieve a pheasant???? Next Post "PHEASANT HUNTING" by John Hightower: First Modern American Book on Pheasant Shooting, and still one of the best! Digby Rocks! You should write a book about him and call it "The Great Digby's" or give him is own t-shirt….."Dachshund's Love Birds Too! "or "I (heart) Bird-Dachshunds"! Well, okay, maybe that's a little much. But he sure is cute!! Let's confiscate or "barrow" Digby and try him out in the North Park on sage chickens!